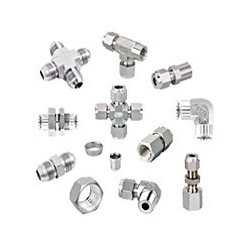 With the aid of ultra-modern machinery and technology, we are engaged in manufacturing, supplying and distributing a wide array of SS Ferrule Fittings. Using stainless steel and other basic components in the production process, we manufacture the entire range with perfection. Also, with the support of vast distribution network, we are able to dispatch our range on-time to the customers' premises. Looking for SS Ferrule Fittings ?